Studies have shown that people’s moods increase with the optimal amount of lighting. Too dark or too bright and your mood declines. Natural light also impacts the body’s circadian rhythm. This is the 24 hour cycle that regulates our health and well being based on the differences between day and night. Our bodies are designed to respond to light. So if we don’t get enough of it, our natural rhythms are thrown off. The natural lighting in your home can have a big impact on how you feel. Finding ways to increase your access to light should be a priority, since natural lighting can improve your mood and overall functioning. Your windows are one of the best tools available to you to make sure your home environment is one that feels good. Regardless of what kinds of windows you have in your home, you can make the most of them by opening your blinds or curtains first thing in the morning. In fact, switching your blinds out in favor of curtains can make that impact all the more apparent. Curtains block less of the natural light than blinds. Extend that natural light by hanging your curtains high and wide. This blocks less light and has the added bonus of making the windows look bigger. Ready for something even more impactful? If you’re considering window replacement, now is the time to replace your old, thicker framed windows. Installing modern, narrow framed windows like those in Great Lakes Window’s ComfortSmart and ecoSmart lines is a great solution. 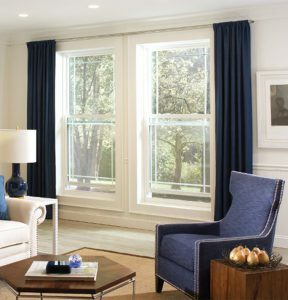 These streamlined windows look great and add resale value to your home. And that sleek look translates to less material blocking the natural light, which will keep you feeling good all year long. Extend those benefits further by choosing large, minimally-framed window styles like picture windows in areas where you want a lot of natural light to come through. Don’t forget about your patio door choices. Sliding patio doors offer more light than French doors, since their frames are much smaller. Consider the quality of light in your home when you’re considering a patio door installation or replacement. Perhaps you’re worried about introducing more light to your home, because you think it might increase heating costs or fade your furniture and artwork. With Great Lakes Windows you can enjoy all of the mood-boosting, aesthetic benefits of natural light. All without having to think about energy efficiency or light bleaching problems. That’s because our windows are highly rated for energy performance. Great Lakes Windows help prevent solar radiation from passing through the window, to keep your indoor temperature where you want it. UV resistance keeps ultraviolet rays out of your home and away from your belongings, without impacting the level of natural light that you are able to enjoy. It’s important to help keep our circadian rhythms working well, especially in winter months when the days get shorter. Your windows are not just a functional and beautiful part of your home, in this case. With the right window design and features, along with interior design choices meant to maximize light, you can impact your health and well being in a positive way. Let the light in and boost your mood with ease! We are here to help you make that happen. Contact one of our experienced, skilled window dealers for more information about how you can enhance your home, and your mood, with Great Lakes Window.